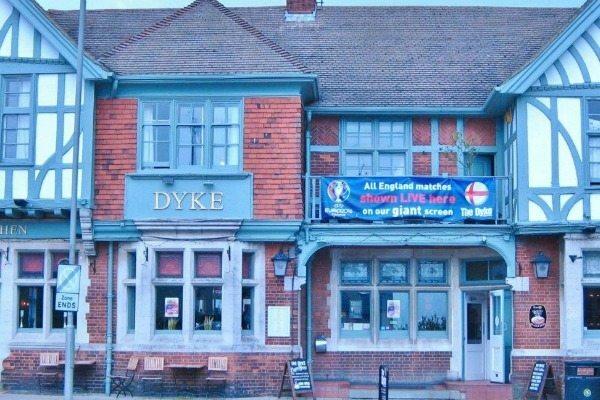 The Dyke Pub & Kitchen is a vast mock Tudor style pub on Dyke Road just a stone’s throw from Dyke Road Park and the recently installed Brighton Open Air Theatre. 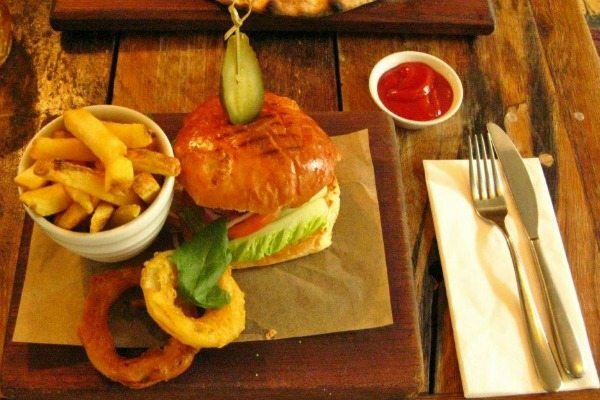 Built in 1895, but recently updated with a fresh, trendy new look, it is now an independent free house with a great family vibe, offering delicious home-cooked food and a comprehensive range of wines and ales. The chefs make all their dishes fresh to order, using seasonal local produce where possible, and they work together to change the menu on a monthly basis. The menu includes fantastic handmade stone-baked pizzas, mouth-watering burgers and other pub staples, alongside a range of more diverse but equally hearty dishes. They don’t touch GM produce and always try to offer a good vegetarian selection and often provide gluten-free options too. 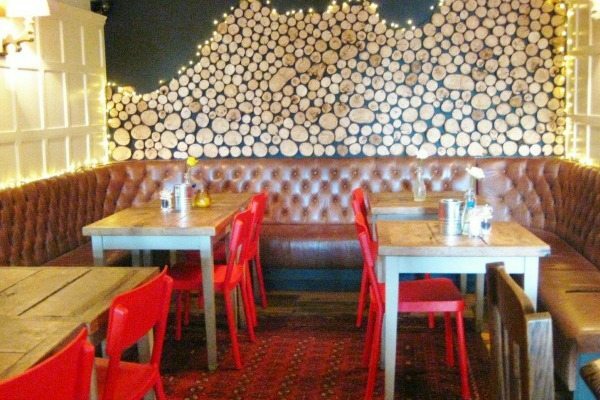 They serve breakfast and freshly-ground coffee, from Brighton’s own Roasted, from 9 a.m. (Mon-Sat), they do an incredibly popular Sunday roast (booking advised) and for the little ones there is a dedicated kid’s menu. Oh, and did I mention they are dog friendly? I had been there a few times and really enjoyed it. I thought it was time to introduce it to some friends. So three hungry humans and three excited mutts (one each, seems fair) arrived for lunch. Within minutes the dogs had been provided with a big bowl of water and dog treats galore. The lovely barmaid came out with a handful of Bonios and was immediately trumped by the chef himself who appeared out of nowhere and produced a handful of fresh ham! So dogs spoilt and bums on comfy seats, we turned to the menu. Once decided, we ordered ales for the chaps and a very palatable glass of Pinot for myself and put in our lunch requests at the bar. While we waited for our food I had a moment to properly take in my surroundings. It really is lovely inside, with wooden floors, bright white walls and high ceilings giving a real sense of space. Cherry red chairs add a cheery splash of colour and whacky design details, like a faux log pile, add a bit of fun. Outside, there is a large beer garden that, like the inside of the pub, is separated into distinct areas, with a paved patio, a tucked-away, enclosed wooden deck, and the rest laid to lawn, with your traditional tables and benches. Before long our exceedingly appetising starters arrived. The menfolk had predictably gone for the provocatively titled “Hot Sticky Chicks”, spicy wings with a blue cheese dip. Their faces lit up when they saw the sheer size of them, somewhere there is an emu running around without its wings! 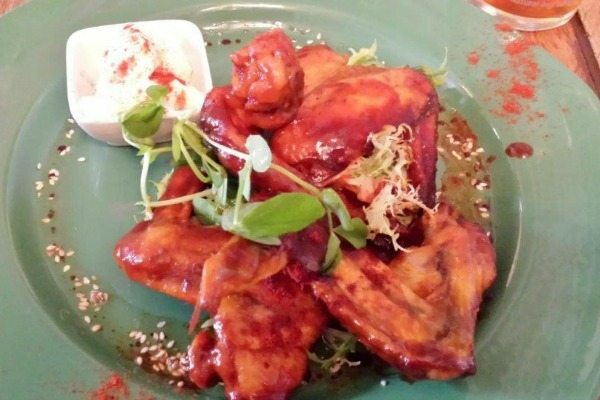 They were generously coated in a fabulous thick, sticky, tangy, sweet sauce and decorated with a sprig of greenery, an artistic dusting of paprika and a sprinkling of sesame seeds. Judging by the sound effects they tasted good! The one bite I was allowed was rich and juicy, with a fantastic slow-building heat. I only wish the lads had been provided with a finger bowl, what a state! I went for the rather more ladylike smoked salmon and peppered avocado tienne with granary toast, crayfish and lemon mayo. 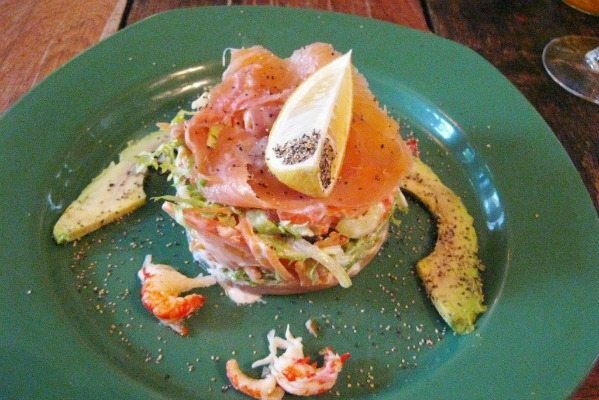 It looked very pretty in a perfectly round stack of fresh, beautifully dressed, crunchy salad and generous amounts of decadent smoked salmon. It also came with slices of creamy ripe avocado, gorgeous chunks of delicate crayfish and lashings of cracked black pepper. It was utterly delicious! I was feeling pretty civilised and superior, sitting there with my barbeque sauce-coated lunch companions, until I managed to stuff a particularly rebellious bit of frisee up my nose. Ladylike, one is not. After a suitable pause to cleanse, free ourselves of invasive greenery and quaff a little more liquor, it was time for the mains. Friend number one went for the prime rib burger with mature cheddar cheese and described it as “very tasty”. High praise indeed for a man of notoriously few words. The burger was moist and delicious, served in a griddled bun with crispy fresh salad and oozing with proper strong cheese, all skewered with a hefty slice of pickled gherkin. He also got a bowlful of lovely, chunky, skin-on chips and a couple of beautifully crisp onion rings. His only complaint was that, as seems to be the trend at the moment, the burger was fabulously thick but at the expense of its width which meant that the meat did not extend to the edge of the bun. Friend 2 had actually wanted the sticky spare ribs but unfortunately they weren’t available that day, so chef recommended the confit duck leg instead. It came with the chunky chips and coleslaw that were intended for the ribs and, whilst the confit duck and coleslaw was a bit of an odd match, it all tasted fantastic. 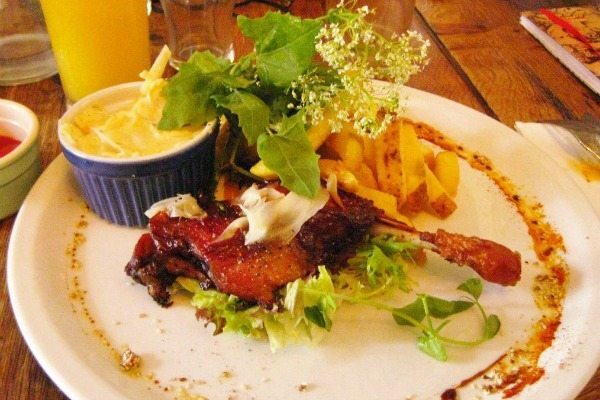 The duck leg had lovely crisp skin and the meat was tender, succulent and tasted divine. I went for the Dyke Picante (which I couldn’t help notice basically translates as spicy dyke, someone with a subversive sense of humour had a lot of fun writing the menu). I love pizza, I eat it a lot, I even have my own pizza stones so I can make them as authentically as possible at home, so I really appreciate a well-made pizza and let me tell you, this was a doozy! 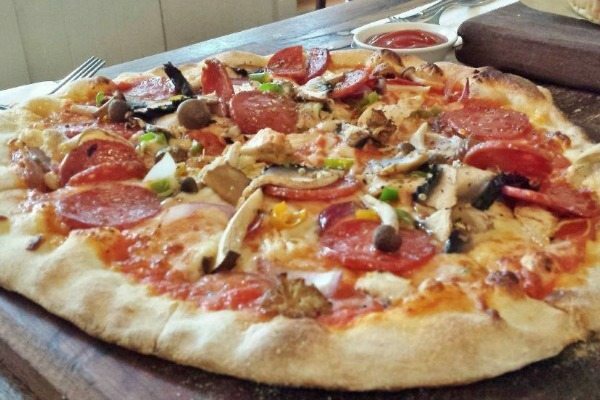 My hand-stretched, perfectly stone-baked pizza was generously loaded with pepperoni, shredded roast chicken, a panoply of delightfully earthy mushrooms, sweet red onions and a mix of spicy chillies, not to mention a healthy amount of glistening cheese. It looked amazing and tasted even better. The pizza chef is clearly a bit of a ninja! Do you get female ninjas? Ok apparently she’s a pizza kunoichi, anyway you get my point, pizza – omnomnom! So in summary, great pub, fantastic service, excellent food.